And The Photochallenge is Back! The new look rickmercer.com website is not only the new permanent home of my blog but now has a fully functional archive of photo challenges. I am convinced that this completely disrespectful feature will lead to much merriment in your home or office. Just click the photo challenge link in the header then click archive to see the results of this week's challenge. Canadians are always impressed when one of our own gets attention south of the border. After all, who among us doesn’t swell up with pride when we see a Canadian individual or a Canadian institution shine on the world stage? From a September email exchange between representatives of Natural Resources Canada and Andrew Okulitch, a scientist working at the Geological Survey of Canada in an emeritus capacity. Irwin Itzkovitch is an assistant deputy minister under Minister of Natural Resources Gary Lunn. Vanessa Nelson is an executive adviser. Okulitch was fired but reappointed two weeks later. The Conservative Party won control of Canada's government in January, after twelve years of Liberal rule. Originally from Harper's Magazine, December 2006. As per the Minister's Office, effective immediately, the words “Canada's New Government” are to be used instead of “the Government of Canada” in all departmental correspondence. Please note that the initial letters of all three words are capitalized. Thank you for your cooperation. Why do newly elected officials think everything begins with them taking office? They are merely stewards for as long as the public allows. 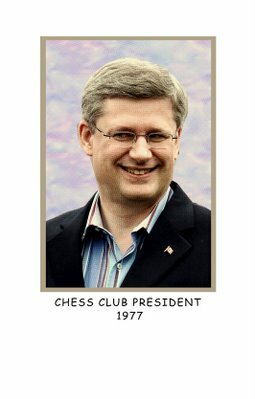 They are the Government of Canada. Nothing more. I shall use “Geological Survey of Canada” on my departmental correspondence to avoid any connection with “New Government.” The GSC, steward to Canada's earth resources for 164 years, is an institution worthy of my loyalty, as opposed to idiotic buzzwords coined by political hacks. Given your strong though misdirected views of the role and authority of the Government as elected by the people, and your duty to reflect their decisions, I accept that you are immediately removing yourself from the Emeritus Program. I wish you every success in your future. Although your knee-jerk response seems typical of Ottawa “mentality” these days, to give you the benefit of the doubt, it may have been mandated by our nervous minister. Of course, it is not a particularly rational decision, and perhaps you might reflect upon it. We of the GSC are used to taking the long view. 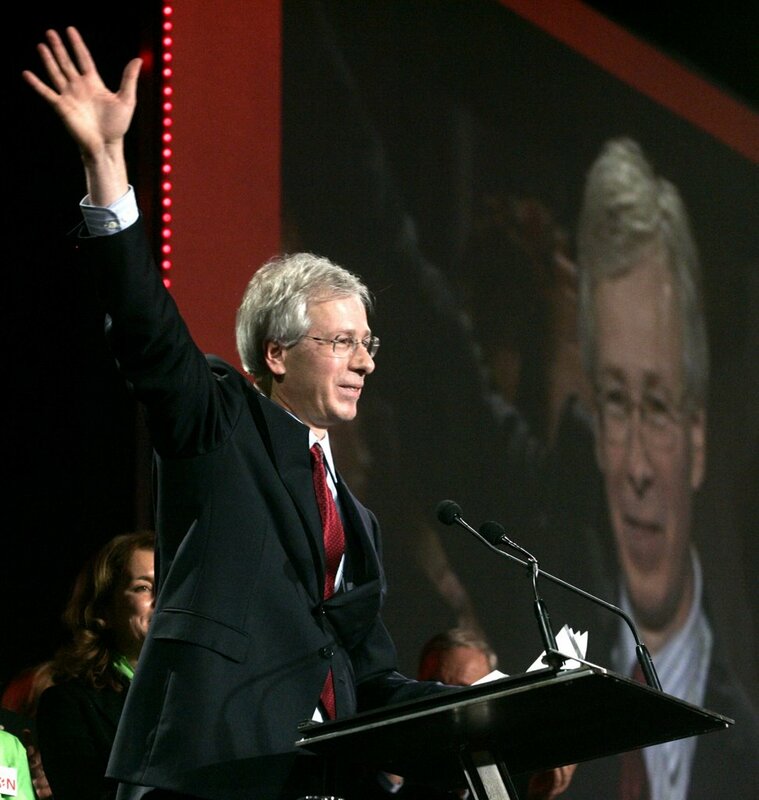 Ministers come and go, but my talents will always remain available to the people of Canada. This is not a knee-jerk reaction nor was it dictated by anyone. My decision stands and I await confirmation that it has been executed by the responsible GSC management. I have just received the clarification of the usage policy for the term New Government, stating that the new wording is required only in documents prepared for or on behalf of Minister Lunn. This limited usage is consistent and appropriate. We would appear to have been victims of an unfortunate misunderstanding. My intransigence about the term was in protest about its misapplication, not a call for civil disobedience. I do understand the need to obey ministerial directives once I am given them clearly. If I can help calm the waters by issuing my own clarification and apology, I would be glad to do so. Your reaction was and continues to be unacceptable for anyone associated with Public Service. My decision stands. As of yesterday you are no longer an emeritus scientist. I concede that my memo was intemperate and deserving of a reprimand. It was, however, prompted by misinformation sent out by your staff. I don't expect that anything I might say now will change your mind, so I'll conclude with a few facts you will now have to live with. I'll come out of this a champion of common sense (except when it comes to sending memos), someone who tried to defuse a situation with humor and made an effort to restore calm. You'll come out as an intemperate, irrational manager who lacks the strength of character to reverse a hasty decision. Do you really want to be remembered as the only assistant deputy minister who sacked an emeritus scientist over such trivia? It is never too late to repair an unfortunate situation if everyone approaches it with an open mind and good intentions. A few months ago General Rick Hillier promised me a Christmas I would never forget; turns out he is a man of his word. This year, on Christmas morning, I was in Sperwan Ghar in the Panjwai district of Afghanistan sitting around a single-burner Coleman stove with a dozen Canadian soldiers. Rush was on the stereo and we were watching a pot of Tetley tea bags threaten to boil. Outside it was wet and muddy, but inside the sandbag bunker where these Royal Canadian Dragoons ate and slept it was warm and as comfortable as one could expect under the circumstances. Corporal Frank Farrell was in charge of the pot and there was no top on it this morning - this was not to be rushed. Gen. Hillier is a very persuasive man. He is also a Newfoundlander. And while he is the chief of the Canadian Forces it has been suggested that he might think he is the chief of all Newfoundlanders. He'll call you up and suggest to you that on Dec. 25 there is only one place you should be and it's so special that by agreeing to go there you render your life insurance null and void. You aren't asked so much as you are voluntold. helicopter for a night flight across the water so we could land on the deck of the HMS Ottawa. On this leg of the trip there were three other Newfoundlanders - broadcaster Max Keeping, singer songwriter Damhnait Doyle and my old colleague Mary Walsh - and three members of the Conservative caucus - whip Jay Hill, MP Laurie Hawn and the President of the Treasury Board John Baird. I was happy they were issued flak jackets and helmets because I had a sneaking suspicion that the combination of Walsh and the three Tories might make some recent skirmishes with the Taliban insurgency seem tame in comparison. If it came down to a three on one donnybrook my money was on the Princess Warrior. And so, on the night before Christmas Eve, our little gang of Newfoundlanders along with 50 or so sailors closed the mess on the HMS Ottawa. We laughed until we were stupid. It felt like Christmas. After sunrise Gen. Hillier addressed the troops on the deck of the ship. This was the first of countless speeches he would give over the next four days. He is funny as hell and inspiring as anyone I have ever seen speak. He makes soldiers laugh and then he makes them cry. He thanks them all in a way that makes everyone grow inches. From a show business perspective he is a tough act to follow, but follow we did. When it came Damhnait's turn to say a few words she sang a song, and if there is a better way to kick off an adventure than watching Damhnait Doyle and 250 sailors sing O Canada on the deck of a Canadian battle ship as it sails the Gulf I can't think of it. entertainers and or the head-injured. When the siren goes do what you're told, when everything seems fine do what you're told and, when in doubt, do what you're told. From there we went "over the wire." It was Christmas Eve and Gen. Hillier wanted to make it to all the forward operating bases. These bases are all former Taliban strongholds. For the most part they are high points of land that were hard-fought for. Some of the bases are nothing but points of land with soldiers living in tents, trenches and bunkers. This is the front line of a war. Charlie Company at Patrol Base Wilson was the first group we spoke to. These are the men and women who are working under maximum threat levels in Afghanistan. They are out there on patrol every day, for days at a time, engaging the enemy. They have all lost friends here. They have a bit of the ten-thousand mile stare - which is to be expected - so from the point of view of a guy who stands around and tells jokes for a living this is what you would call a tough crowd. Gen. Hillier was right though, he told me that just showing up was enough and everything else was gravy. That afternoon we made our way by convoy to Strong Point West, home to Bravo Company. This was still Christmas Eve and we arrived in time to help serve their Christmas meal. Gen. Hillier worked the turkey, senior officers worked the potatoes and vegetables and I pulled up the rear as chief gravy server. I must admit I felt pretty darn important serving the gravy. These guys get a cooked meal about every three to four days. For the most part they eat rations out of a bag where they find themselves. Plus they get shot at. Anything hot with gravy is a very, very big deal. As the man with the gravy ladle I was probably - for the duration of the serving line - the most popular man on Earth. And so this year for Christmas dinner I sat on the ground in the dust and ate turkey loaf and gravy on a paper plate. Everyone except me had a gun. There was lots of talk of home and like anyone's Christmas dinner there were lots of pictures. At one point the designated photographers had 10 digital cameras in their hands at a time trying to get the group shots. Everywhere you go in Afghanistan where there are Canadian soldiers you see Christmas cards and letters supporting the troops. Some of the tents and accommodations are decorated with so many home-made cards from school kids that you would swear you had wandered into an elementary school lunchroom and not a mess hall. It's amazing to see groups of battle-weary soldiers wrapped in ammunition and guns stopping to read these things with the attention that is usually reserved solely for the parent. I was in a tent with two guys in their early 20s who were poring over a stack of letters and class photos and separating them into piles. I was a little taken aback that these young guys, in the middle of a war zone, would be so moved by support from Grade 4 classes until I realized the deciding factor for the favourites pile was which teacher was hotter. On Christmas morning, the convoy headed to Sperwan Ghar. The troops here sleep in dugouts with sandbag perimeters. After the speeches and hellos a corporal asked me back to his quarters for a cup of tea. He was, like so many guys here, a Newfoundlander. And so that's where I spent Christmas morning, watching corporal Frank Farrell stir the teapot while a dozen or so guys hung out and exchanged cards and had a few laughs. The crowd in the bunker wasn't there just for the tea. They had been waiting a long time for Corporal Farrell to open the Eversweet margarine tub that he received a few weeks ago in the mail. In the tub was his mom's Christmas cake. When the tea was perfect and our paper cups were filled, the tape was pulled from the tub and we all agreed: Bernadette Farrell makes the best Christmas cake in Canada. The trip carried on. We visited more forward operating bases. Gen. Hillier made good on his goal of shaking hands with practically every soldier in harm's way this Christmas. 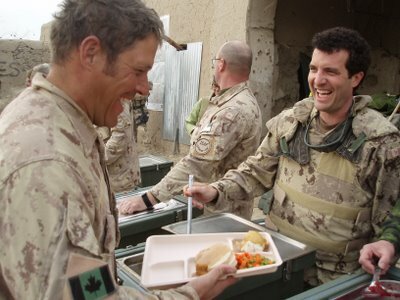 And by late afternoon we took the convoy back through "ambush ally" to the main base in Kandahar for the prime show of the tour for about 800 soldiers in the newly opened Canada House. 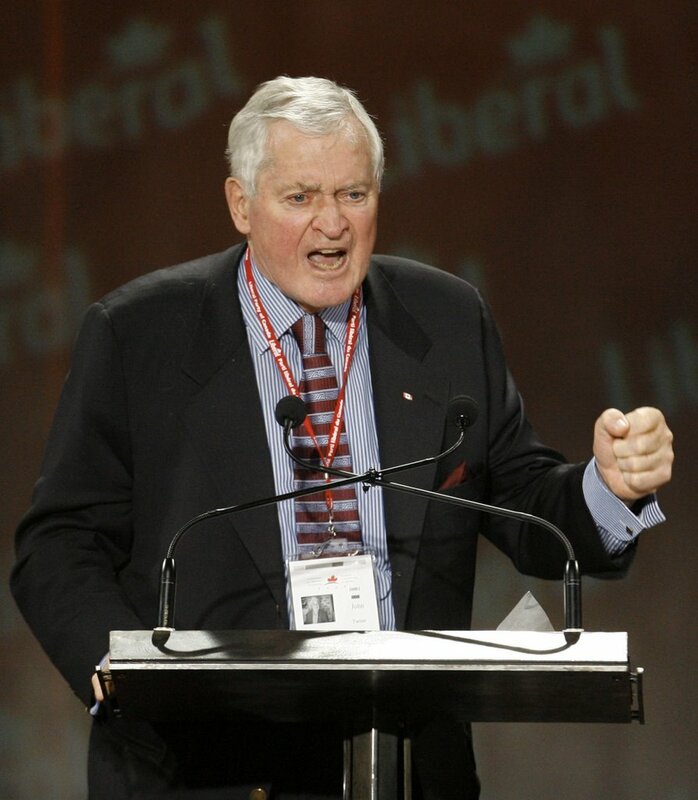 Max Keeping was our Master of Ceremonies, Gen. Hillier gave a speech of a lifetime, Mary Walsh made me laugh like the old days, Damhnait Doyle sang like an angel and the Montreal rock band Jonas played late into the night. I was supposed to take the mic for 15 minutes, but I stayed for 25. A tad selfish, but honestly I can't imagine I will have so much fun performing ever again. Everywhere we went on this trip men and women in uniform thanked our little gang for giving up our Christmas to be with them in Afghanistan. I know that I speak for everyone when I say we gave very little and we received far too much. We met great friends, we had lots of laughs and dare I say had the best Christmas ever. The second ballot results have sent the Iggy people into apoplectic shock. Looking at the candidate on TV he looks visibly shaken. I think he should compose himself and take this moment to reflect and enjoy the experience. After all, after this vote it will be a long time before he sees his name on a ballot again (barring of course the annual sexiest professor poll at Harvard – his name goes on that ballot the minute he signs his new contract). It’s times like this that a candidate should show grace under pressure and I think it was beneath Iggy to accuse Gerard Kennedy of committing a war crime by throwing his support to Dion. The Ignatieff delegates I’ve been talking to have that tragic air of someone in palliative care eating apple sauce and making big plans to run a marathon. In this room if you wave your blackberry around as you speak it carries the same weight as waving a bible around at an evangelical conference. It’s in the good blackberry it must be true! 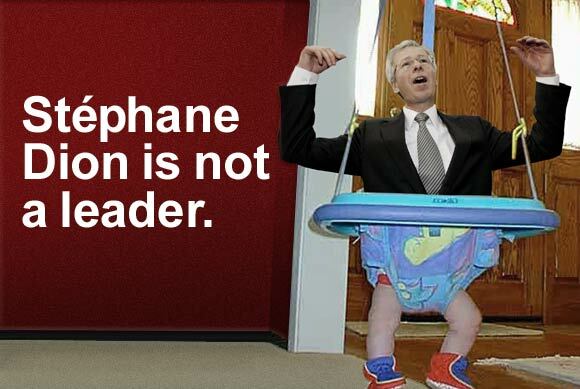 The only guy having a good day at this point is the soon-to-be leader of the opposition Stephane Dion. The one advantage of showing up to a party stone cold sober at 1:50 am is that you will probably be the only one who remembers anything. The disadvantage is that by the time I arrived at ground zero the delegates were drunk and confident – a bad combination. The Delta hotel lobby was a zoo just a few hours ago. Hundreds of young people were circling like parched animals in search of a watering hole. There were no shortage of options – on the way to the elevator I was told that there were free shots in a Dryden room and a huge Dion event happening with a free ice vodka fountain. I kind of felt nostalgic for the days when I would walk over broken glass looking for such a Shangri-la, but alas those days are gone. I ended up having a few Heineken in a room that apparently was rented by Paul Martin. Martin wasn’t there but there was a huge podium in the corner that apparently he practices on when preparing for a big speech. There are two schools of thought on Ignatieff’s early round results: it’s possible that Ignattief’s people intentionally surpassed a pile of votes on the first ballot, knowing they will come to him on the second. This is an old trick that guarantees that there will be growth on the second ballot and give the illusion of momentum. My gut is telling me this is not what happened. I talked to one Iggy delegate last night who was vicious because he saw three Iggy ballots destroyed and on the floor in the voting area. He seemed to think there was some sort of conspiracy afoot. I figure that those three ballots either belonged to people who are too stupid to get the slip of paper in the slot or people who just couldn’t bring themselves to do what it was they promised to do months ago. I just watched Iggy get cornered by CBC’s Julie Van Dusen and she asked what his reaction was to the first round results. Iggy said that his first round results were lower than expected because he spoke last and as a result some of his delegates didn’t get a chance to vote. If that’s the best line the Iggy brain trust can come up with that camp is in serious trouble. "So what if I'm drunk? They screwed me Dryden, and they'll screw you too!" Tonight I fly to Montreal and figure I will hit the convention at ten pm. I’m worried that everyone will be in bed by then but I will just have to wait and see. I am shooting the show tonight so while that happens I will be recording the candidates' speeches so I can watch them on my laptop during the flight to Montreal. Would the giant tool in aisle 12 please stow his computer and put his tray in the upright position. Why am I attending? My plan is to find out first hand whether or not the Liberal party is a vital political force in the midst of an historic renewal or are they simply a herd of dinosaurs in their final death throes. I also hope to find out if the beer will be cold. All will be revealed at rickmercer.com, or at least the beer question will be answered. So far I have tried to watch as much of the convention as I could but work keeps getting in the way. I was lucky enough to catch the opening ceremonies and they certainly set the tone. I am not much of a fan of this “nation inside a nation" notion but when the Quebecois are in charge of booking the talent it’s hard to argue with it. I would suggest that whoever thought it was a good idea to feature the dancing dude in the super tight pants and giant mullet so prominently is not just from another nation but another planet. 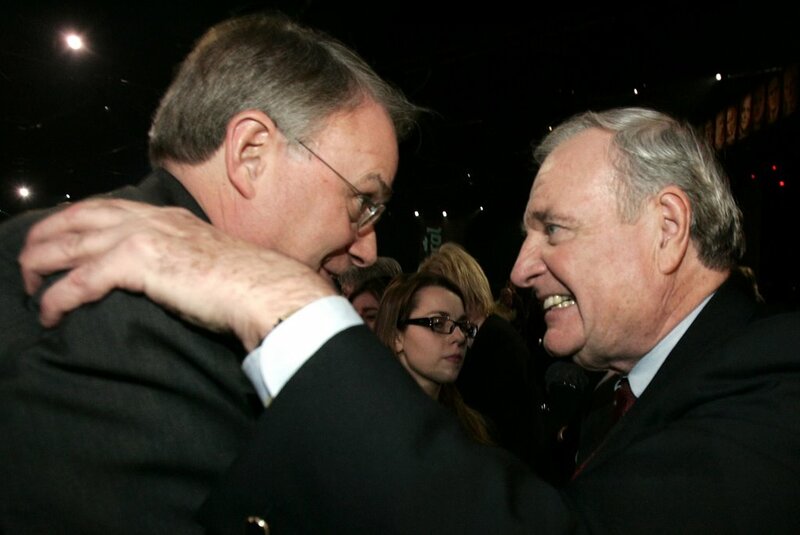 I missed the tribute to Paul Martin because of work last night but I did get home in time to catch his speech. Too bad he didn’t make a few more like that during the campaign; he might have avoided this whole messy retirement ordeal. It was refreshing though to see Martin speak without him promising all Canadians free tuition or a billion dollars. It was a good speech though; I’ll give the man that. The baby was a nice touch; I might try that next time I have to address a crowd.